I bet you didn't know that today January 28th is National Lego Day. Well, Happy National Lego Day! I have fallen in love with Legos. Don’t get me wrong I have been playing with them for years, but something just recently snapped in me and I have discovered such peace when I just put together a piece. Just the act of separating and organizing the blocks gives me such a sense or relaxation that I could do that for hours. Ha I have done that for hours. Since I am such a lover of knowledge (Nerd Alert) I thought this would be the perfect time to dive into a little history. The first version of Lego was created in 1949 from the Lego Group which they called the “Automatic Binding Blocks”. The blocks started out as wood, but due to Ole Kirk Christiansen, creator of the Lego Group, and his determination to produce the highest quality the blocks began to be produced in plastic. Now by 1951 only two years after the original idea began production the Automatic Binding Blocks were half of the production of the Lego Group. In hindsight no one is surprised about this, but I can only imagine the surprise that such a simple idea was just amazing. A simple block that provides the user with such creative capabilities. In July of 2015 they had produced 600 Billion pieces of Lego. That is just insane. It does get me thinking if there are so many Legos all over the world what are people doing with all of them. So being the curious little one that I am I dove into the internet to find some awesome Lego creations. Mrs. Crazy Creations on Etsy has this just amazing creation she does for people. She makes a picture that is fully customized using Lego pieces for people. I absolutely love it! She has valentines creations like below as well as family portraits, key chains and other various amazingly adorable creations. Whats That on Etsy is a Lego oriented shop. They make Lego Creations and Christmas ornaments entirely out of Legos. It is adorable. One of their Valentines creations is my absolute favorite. It's even similar of one of our designs. Great minds do think alike I guess. 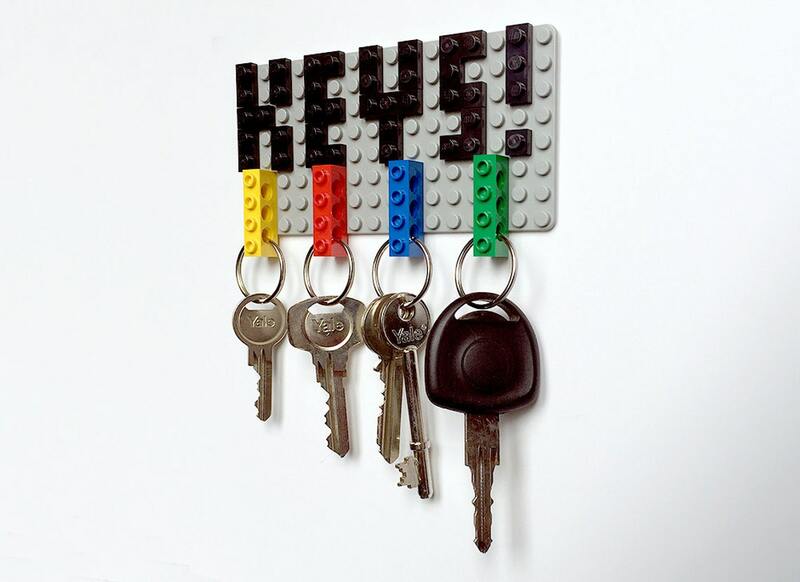 There are some many uses people have found with legos and I find it just fantasic that we can utilize things that are found all around and recycle them. Noted that there are probably a lot of these creations out there people are buying the materials brand new, but I still find it cool. Like this Key hold here that I found through pinterest! DunoStuff on Etsy makes and sells these and I love it! It kinda makes me want to build one of these on my Tinker Time with Kari. What do you think? It you search though etsy or pinterest you will find there are several versions of the use of legos and keychains all of which are just amazing. This is something you can even do with your children. They could have their own little key chain spot even if they don't have keys. They can hang their play keys up. Do you have company coming over and no coasters for all those glasses that will be spread about? No worries just grab some legos and build yourself some. Find that your clock really doesn't represent the type of person that you are? We have you covered. Lego as a fashion statement isn't anything new, but one of my favorite ways to show my true love of the toys or really anything is when we get punny. What is better than a shirt that says it how it is in so many ways. You know what I'm talking about. I do love one of our newer holiday designs. It is perfect for kids or adults. "Hold Me and Never Lego"
Legos have inspired people for nearly 90 years to build, create and dream of something greater. I love how we can take the act of playing and transfer it functions of our life may it be clocks, coasters, bookends or keychains. Legos are fantastic and I think I'm going to go play with some now. What would you build with some Legos? Happy National Lego Day Everyone! If you enjoyed this post make sure to subscribe to more!